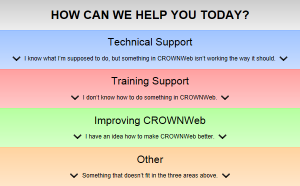 CROWNWeb New User Training offers a comprehensive introduction to CROWNWeb. Students in this ONE-DAY training event will learn the basics of using CROWNWeb to manually enter and submit data to CMS. Content is presented in an easy-to-follow format by certified trainers with ample opportunity for questions and feedback, and progress is measured periodically by pop-up interactive quizzes. CROWNWeb New User Training slides can be viewed and downloaded by clicking here. NOTE: Audio for this event is provided via streaming internet – connect speakers or headphones to listen. A limited number of dial-in numbers are available if streaming is not available.